When Deja’s family loses their home and are forced to move to a shelter, she starts fifth grade at a new school. She’s embarrassed by her family’s situation and braced for judgment from the other kids. Instead, Ben, also a new kid, and Sabeen, a sweet girl who covers her hair with a scarf, become Deja’s new friends. As their teacher, Miss Garcia, begins a unit about history connecting to the present, the class learns about the World Trade Center towers falling on September 11, 2001. The material covered in the classroom is gentle and oblique, but Deja feels there’s a much more gruesome truth that no one dares to tell her. 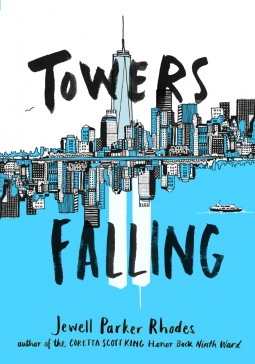 Her questions and research lead her to a harder realization: a connection between her father’s anxiety and respiratory illness and the terrorist attack that caused the collapse of the towers. Before I picked up this novel and still now that I’ve finished it, I can’t help but admire the author for tackling the topic of the September 11 attack as the basis for a middle grade story. For the most part, I think the topic was handled with extreme care. Deja’s dad is extremely uncomfortable at first when he learns that the school is teaching his daughter about the terrorist attack. He visits the school and speaks with Miss Garcia and the school’s principal. I liked the inclusion of that element. It felt very real and natural, and certainly something that concerned parents may do. Deja had her own anxiety about what would happen as a result of her father’s visit, and her friends and trusted adults in her life were able to reassure her. At one point Deja and Ben skip school to visit the memorial site where the World Trade Center once stood. They return home to find worried and angry parents, but there’s not much discussion about it beyond that. I can only find one issue with the story. Many scenes take place in a classroom or other forum where someone else educates Deja about the history of the September 11 attack. This leaves the book feeling a bit preachy at times. Sometimes Deja privately processes the information she’s been told. Those were some of the most powerful moments in the story. She begins to understand how much the past affects her present, something so simple but so true and nicely woven into the plot of this tale. Deja and her family are African-American. Her mother moved to the United States from Jamaica, as she says, for a better life. Ben’s grandmother comes from Mexico. Sabeen’s family is from Turkey. They are practicing Muslims. Deja meets Sabeen’s parents, grandmother, and her uncle and enjoys dinner with them of traditional Turkish foods. Sabeen also makes Turkish delight and baklava to share with her friends. The diversity of the character cast felt very organic and natural to the story. I enjoyed the richness it brought to the novel, and especially the descriptions of the food prepared by Sabeen’s family, as it sounded delicious! Deja’s friend Sabeen and her family practice Islam. She briefly discusses the prejudice against Muslims that her family faces in America and how hurtful this is to her family. Deja and Ben watch videos online showing the towers falling. She notices people leaping from the building. Her father suffers from a debilitating illness. At one point Deja wonders if the doctor has changed his medicine. Tagged Jewell Parker Rhodes, Little Brown and Company BFYR, netgalley, September 11, Terrorist Attack, Towers Falling, World Trade Center. Bookmark the permalink.